The Global Volcanism Program has no activity reports for Pali-Aike Volcanic Field. The Global Volcanism Program has no Weekly Reports available for Pali-Aike Volcanic Field. The Global Volcanism Program has no Bulletin Reports available for Pali-Aike Volcanic Field. The 3000 km2 Pleistocene-to-Holocene Pali-Aike volcanic field straddles the Chile-Argentina border north of the Straits of Magellan, about 150 km NE of the town of Punta Arenas. The southernmost of the Patagonian basaltic plateau lavas, Pali-Aike contains lake-filled maars and basaltic scoria and spatter cones with associated fresh-looking lava flows. The distribution of maars and cones indicates that eruptions occurred along regional fissures oriented E-W and NW-SE. The earliest eruptions produced maars and associated lava flows that are now exposed only in river valleys. A second stage formed now-eroded spatter cones and soil-covered lava flows. The youngest cones and lava flows are found in the SE part of the field. The most recent volcanic event produced scoria and spatter cones and fresh lava flows not covered by soil. Ejecta covers prehistorical artifacts (Skewes and Stern, 1979). D'Orazio M, Agostini S, Mazzarini F, Innocenti F, Manetti P, Haller M J, Lahsen A, 2000. The Pali Aike volcanic field, Patagonia: slab-window magmatism near the tip of South America. Tectonophysics, 321: 407-427. Mazzarini F, D'Orazio M, 2003. Spatial distribution of cones and satellite-detected lineaments in the Pali Aike volcanic field (southernmost Patagonia): insights into the tectonic setting of a Neogene rift system. J. Volcanol. Geotherm. Res., 125: 291-305. Skewes M A, Stern C R, 1979. Petrology and geochemistry of alkali basalts and ultramafic inclusions from the Palei-Aike volcanic field in southern Chile and the origin of the Patagonian plateau lavas. J. Volcanol. Geotherm. Res., 6: 3-25. There is no Deformation History data available for Pali-Aike Volcanic Field. There is no Emissions History data available for Pali-Aike Volcanic Field. A lava flow of the Pleistocene-to-Holocene Palei-Aike volcanic field is seen here from Cerro del Diablo. The large volcanic field straddles the Chile/Argentina border north of the Straits of Magellan. The southernmost of the Patagonian basaltic plateau lavas, Palei-Aike contains lake-filled maars and basaltic scoria and spatter cones with associated fresh-looking lava flows. Photo by Andres Figueroa Zurita (courtesy of Oscar González-Ferrán, University of Chile). 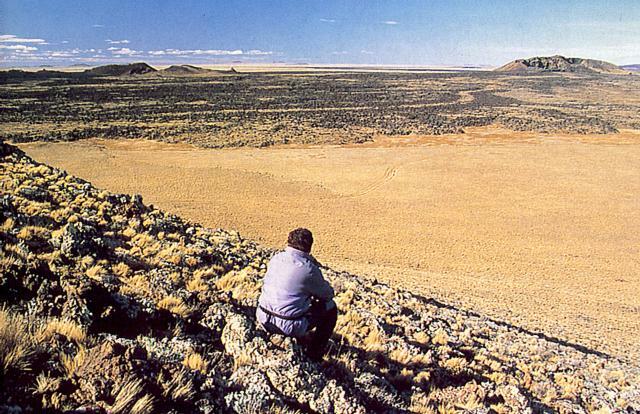 There are no samples for Pali-Aike Volcanic Field in the Smithsonian's NMNH Department of Mineral Sciences Rock and Ore collection. Large Eruptions of Pali-Aike Volcanic Field Information about large Quaternary eruptions (VEI >= 4) is cataloged in the Large Magnitude Explosive Volcanic Eruptions (LaMEVE) database of the Volcano Global Risk Identification and Analysis Project (VOGRIPA).